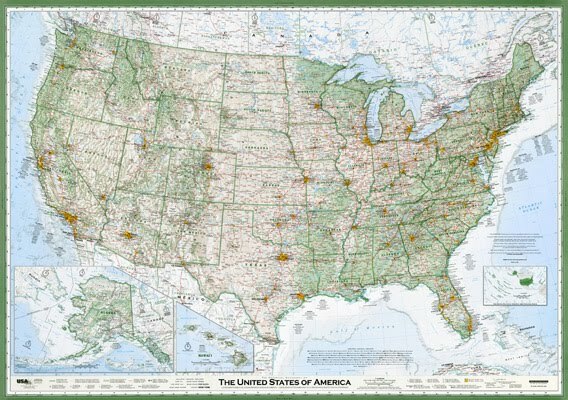 This wall map of the USA by David Imus is currently doing the rounds as an example of quality cartography. It recently won the CaGIS best in show award and there's a good write-up at Slate.com. It's a good map. Possibly not 'great' in the sense that he takes a fairly standard approach to designing a general reference map...but it's certainly 'good' because he does apply cartography well (and there's nothing wrong with that). There's very little on the map that hasn't been done before though and here's where my concern lies...we live in an age where 'good' stands out from the crowd. In the Slate.com write-up one line explains this general problem in modern map-making: “The overall goal is often a quick and dirty turnaround, with cost and speed trumping excellence and elegance”. I see this approach every day and so rarely do we see excellence and elegance in design that a 'good' map becomes something of a rarity. Imus did a good job on his map but what I'd like to think his efforts have done more than anything is illustrated that clear design is fundamental to good map-making. The more examples we have that show how good cartography can be applied, the more we might persuade those who prefer the speedy and cheap route to making a map that design matters. Maybe once we've cracked that nut we can get back to making excellent and elegant maps as well.